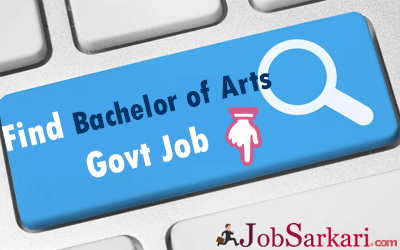 What are the various job prospects for the students in Bachelor of Arts? The present scenario of government jobs has changed from that of the earlier times. With the increasing level of competition, the scope of making a place in the government job has reduced. The students look forward to a lucrative career in their specific area of interest. The opportunity in the examination depends on specific major subjects that the students pursue. In some cases, the candidates have to appear for a multiple of examination. Most of the examination has two tiers followed by group discussion and personal interviews. To enhance the chances for employment, the Indian public sector is increasing more scopes for examination and recruitment among the youth. Given the present scenario, every individual wants to have a reputed job with a handsome package. With the current opportunities, they get the chance for a healthy and bright future. Below are some of the listed jobs that are suitable for the Bachelor of Arts student in public sector. Master of Arts Post Graduate Jobs. The Bachelor of Arts is a very common degree, but you have a lot of job opportunities to start your career. Some of them include IAS, bank jobs, etc. After completing the graduation degree, you can apply for the public banking sector. Banking jobs are the best-desired ones among the youths. The recruitment process involves two-tier examination followed by group discussion on any topics about banking sector or current affairs. If the candidate succeeds passes in the group discussion, they are selected for the personal interview round. The procedure remains the same for whichever government sector bank they apply for. The staff selection commission offers opportunity both for the graduate level students as well as for the higher secondary students. It is also undertaken in two tiers where the different posts include ministry departments, Inspector Posts, and many more. This designation varies according to the group of the post that you apply for. Other than the two tiers, some of the posts also require data entry skills. The candidates have to pass a data entry skill test to qualify for the post. With good pay scale, it also offers different amenities in whichever department you apply for. Working in the education sector can be extremely rewarding. When it comes to teaching sector, you can apply for any government schools, either at the primary level or the secondary level. You can apply for the post of trained graduate teacher, and the chose the subject according to your major subject in the graduate stream. Most of the state public service commission invites application for recruitment in the post of school lecturer in different subjects. Under the Indian railways, the BA graduate students can apply both for technical and non-technical posts. The SCRA or Special Class Railway Apprentices exam is conducted by Railway Recruitment Board. The examination comprises of sections. Candidates would find opportunities in different departments under the railway sector.